Spider-man: Into the Spider-verse is an amazing piece of art and is, to-date, the best rendition of Spider-man that has ever been animated. It seems like, especially lately, the world of animated films has stepped up its game. Spider-man: Into the Spider-verse is no exception to this rule. Now, you can own this Oscar-winning film on 4K UHD, Blu-ray, DVD and add it to your home entertainment collection. In this film, we meet Miles Morales (Shameik Moore; Dope), a teenager who lives in New York City. Morales, who attends a Science and Engineering High School through the week, idolizes Spider-Man. He lives in a dorm during the school week but sometimes manages to sneak out and visit his Uncle Aaron (Mahershala Ali; Moonlight). One night, however, a run of the mill visit turns into an experience of a lifetime. Miles happens upon Spider-Man in pursuit of villain Wilson Fisk (Liev Schreiber; Spotlight), who has created a Super Collider that can destroy the world. When Spider-Man winds up dying during the attempt to capture Fisk, Miles is devastated. During all of this, he also gets bitten by a radioactive spider and wakes up the next morning with new powers. However, he soon learns that he isn't alone. The Super Collider that was created has opened up different dimensions and brought various "spider-people" from other dimensions. Now, they all must team up to destroy the collider and Fisk's diabolical plans. This film is full of top-notch acting/voice talent. In addition to Moore, Ali, and Schreiber, Chris Pine (Star Trek Beyond) lends his talent to the Spider-Man who meets his demise in front of Miles. We also hear Jake Johnson (New Girl), Hailee Steinfeld (Bumblebee), Lily Tomlin (I Heart Huckabees), Nicolas Cage (The Rock), and Zoe Kravitz (Divergent). The story is fresh and clever and always keeps you on your toes. At no time does the film feel like it is dragging. Presented in 1080p AVC Spider-man: Into the Spider-verse looks and sounds amazing in this home theater presentation. The picture is sharp and clear with zero artifacting. With such a large color depth and palette used in the creation of the film it really transferred well for the home theater market. The animation - reminiscent of old newsprint – with a lot of vibrant colors, simply comes alive around you. The audio presented in DTS-HD Master Audio 5.1 plays its role well. The dialog is crisp and clear, while the special effects bounce off the walls around you taking you fully into the world of comics like you never have before. It also showcases the eclectic soundtrack nicely. We Are Spider-Man: A look at the diverse crew of "spider-people" and the message of how anyone can be a hero. Spider-Verse: A New Dimension: In this feature, we hear from artists and filmmaker about their love of the comic genre and their contributions. The Ultimate Comics Cast: Enjoy a look at this feature of characters that are part of the Spider-verse and those who portray them. A Tribute to Stan Lee & Steve Ditko: A well-deserved look at the amazing legacy of Stan Lee and Steve Ditko. The Spider-Verse Super-Fan Easter Egg Challenge: Fans are given the ultimate challenge to find all the Easter Eggs in The Spider-Verse. Designing Cinematic Comics Characters: A look at the character design in animation. Alternate Universe Mode: A look at alternate scenes, characters and plot lines with the filmmakers. Original Short "Spider-Ham: Caught In a Ham": Join an adventure with Peter Porker, a.k.a. the Spectacular Spider-Ham. Spider-man: Into the Spider-verse is an amazing piece of art brought to the big and small screen by a great team at Sony Animation. To-date this might be the best rendition of Spider-man that has ever been animated. The story is fresh and fun, and the animation truly takes your breath away. 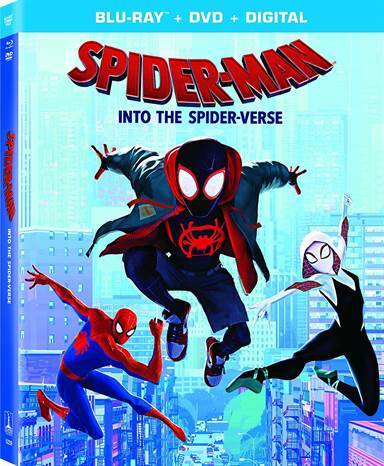 If you do not own this film and love Spider-man, animation, or just a good film, you owe it to yourself to go get this movie.